Air Tumble Rumble is the eighth world in Mini Mario & Friends: amiibo Challenge. It is unlocked by entering the amiibo Door in Level 9 as Mini Bowser Jr. Only Mini Bowser Jr. can enter this world and traverse its levels. In Air Tumble Rumble, the player encounters many spikes where Mini Bowser Jr. can showcase his Spike Guard, an ability that allows him to walk on spikes without taking damage. Also found in large amounts are fans, which, when tapped on, are toggles on and off which allows Bowser Jr. to fly across. 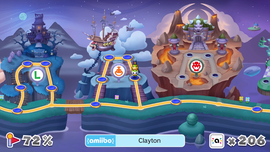 Air Tumble is themed around New Super Mario Bros. Wii, featuring many elements from that game. The soundtrack of this world is an arrangement of Bowser Jr.'s battle theme from New Super Mario Bros. Wii. This page was last edited on August 31, 2018, at 12:45.